I know that I am probably the last person in the country to read this book--it has actually been sitting in my TBR pile for almost a year. I've wanted to read it--I've heard so many good things about it--but I knew I needed to wait until the month before my book club meeting where we would be discussing it. There was a real danger with this book--the subject of two teenagers dying of cancer could very easily go the route of the Lifetime movie. Luckily, Green deftly directs the story so that it rings true instead of saccharine. I will admit that I had to peak ahead to the end of the book to prepare myself (anyone who picks up this book will know that there are really only two possible endings to this story, both of which are devastating). But, frankly, all the wonderful things I've heard about this book are true and I'm not ashamed to admit that I bawled my eyes out reading it. One thing that I particularly loved about this book, besides the central love story, is the relationship that Hazel has with her parents. After all, I was reading this as a parent, not as a "young adult." I appreciated that the parents were present in this book as it would have been all too easy to relegate them to the background. I found the relationship that Green created here to be realistic and touching and, while maybe not integral to the story, it helped to give it depth. If you haven't read this yet, read it now. Really. I mean it. And stock up on tissues. I was not solicited for this review and I received no compensation for this post. Melinda, I have a bad relationship with a lot of the books I "have to read," "everyone is talking about it and thinks it's fabulous." I avoided this for a long time. When I read it...I Loved it. For the reasons you mentioned and so much more. I would love to discuss it with a book club. Wish there was one around here to join. Have a great day! Honestly, I've given up on reading books after I started my professional career though I still enjoy visiting a bookstore and reading synopsis there. One day, I saw The Fault In Our Stars. It interests me so much so I downloaded an ebook of it for free. 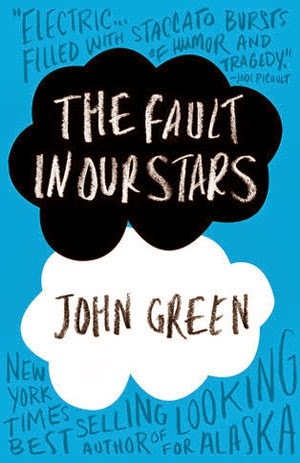 I read the first chapter and got hooked with John Green's writing. I then bought a hard copy and finished it just last week. It was a beautiful story. Now, I would like to get back to reading because of this. Anyway, the book's right has been bought. It will be a movie next year. I hope they'll play Holocene by Bon Iver and include it in the movie's soundtrack.